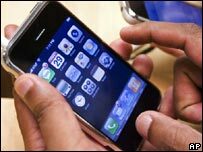 BBC NEWS | Business | How smart does your phone need to be? Mobile phones come with ever more features; whether we use them is crucial to a billion-dollar industry. Can your phone take pictures? Probably yes. Your answers are important - not just when you decide on your next mobile phone. A whole range of industries is waiting for you to make up your mind, because it bets that you will want a phone that is smart, and sends and receives plenty of data. Once upon a time the dividing line was clear: there were smartphones, expensive but chunky bricks with plenty of office applications; and then there were smaller consumer phones that allowed you to text and talk. Today, boundaries are blurred. So-called feature-rich phones are everywhere. Unlike true smartphones they may not be able to run more than one or two programs at a time. Apart from that you'll be hard pressed to tell the difference. To make such a phone a true money spinner, it has to have a fast 3G data connection, says Paul Goode, senior analyst at M:metrics, a consulting firm. Office, e-mail, music, web, GPS - anything else you need? In the UK, that's about 20% of all mobile phones. In Italy, which is Europe's leader in all things mobile, nearly a third are 3G-enabled. 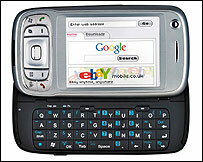 Take HTC's TYTN II, sold on the UK market by T-Mobile as MDA Vario III. With its slide-out keyboard and tilting screen it resembles a mini laptop, complete with browser, office software and GPS navigation system. But do people need mini-computers like that? 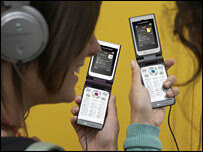 "There are two categories of phone users," says Anders Runevad, head of sales at phone maker Sony Ericsson. "Those who have time to kill: they want to fill it with entertainment, blogging, surfing and sharing with friends. And those who have time to create: they use office applications, calendar, e-mail." The industry is working hard to find out which features are best for what kind of user. "Most phones sold into the market now tend to specialise in different things - the internet, music or e-mail," says Richard Warmsley, T-Mobile UK's head of internet on the move. "It's about matching different types of services with the needs of different customers." "Yes, we in the industry push features on consumers," says Mats Lindoff, the chief technology officer of phone maker Sony Ericsson. Take camera phones. They were derided at first. Today half of all mobile phone users in the UK take pictures with their mobiles, and a quarter send them on. Camera phones have been a "phenomenal success" says Paul Goode. Now the industry hopes that mobile data - web, e-mail, music downloads - will be the next goldmine. For manufacturers the economics are clear: "We make quite a lot of money on both smart and feature-rich phones," says Mr Lindoff. And the smarter the phone, the bigger the usage of data. Smartphone users are five times more likely to watch television and three times more likely to listen to music on their phone than normal users, which boosts the revenue of network operators. But do smart phones also translate into higher revenue for operators? "Yes, absolutely," asserts Nigel Clifford, the chief executive of Symbian, which makes operating systems for mobile phones. "We see more downloads of applications, picture sharing, more activity - and higher average revenue per user." This view is echoed by Sony Ericsson's Anders Runevad. "Feature-rich phones are important for the whole ecosystem [of the mobile phone industry], for us, the network operators, the application and content providers." Data usage "has already moved out of the early adopters stage," says Paul Goode at M:Metrics. T-Mobile is reporting double-digit growth for mobile internet usage in the UK during the past 18 months. The level of mobile browsing, however, depends on which phone you use. Owners of Symbian phones, for example, use more data services than those of other phones, according to M:Metrics, although Mr Goode cautions that this is also due to the fact that owners of smartphones tend to be richer than most and can afford to do so. 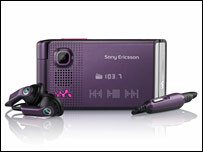 Sony Ericsson, for its part, promises network operators that owners of its line of walkman phones are bringing in more money by downloading more music than others. Indeed, music (including ringtones) has so far proven to be the only killer content for mobiles. Mobile phones are getting ever better at playing music. A third of people having a media player on their phone have dumped their single-purpose MP3 player, according to M:Metrics. That's the reason why Apple developed the iPhone, says Mr Goode. "Apple had no other chance, because MP3 players are on the way out." However, he also stresses that music still has some way to go. Right now only 10% of all phones can play music. And it's questionable whether other fancy applications can succeed. A year ago, 40% of 3G users browsed the web; now only 30% do. It's not that people have stopped going online on-the-go. Rather, many new phone owners are less tech-savvy and can't be bothered using their fancy phones to the max. "We are packing more and more functionality into these phones, but there just aren't enough 10-year-olds around to explain how to use all that," quipped a speaker at the recent Symbian smartphone show in London. No wonder that John McCullen, chief technology officer of Bluestreak Technologies, exhorted the industry to follow the KISSE principle: "Keep it [the mobile user experience] simple, stupid and enjoyable." The battle over usability and content is fought in an increasingly crowded space - and features the replay of operating system battles of old. In the red corner the reigning champion, Symbian, backed by the world's largest mobile phone manufacturers and with a 70% share of the top-end of the market. In the blue corner Microsoft, for once the underdog. In the green corner newcomer Apple, playing its usual role of selling nicely designed but perfectly closed systems. On the sidelines Research in Motion, cornering the market for corporate e-mail on the go. Linux fans once again promise that their software's big break is just around the corner. And then there is Google, which actually may make Linux dreams come true. With $13bn in cash to play with, the search giant from Mountain View, California, is promising a Linux-based mobile phone operating system, dubbed Android and designed to bring us the truly mobile web. While these rivalries are fun to watch, they have yet to deliver for customers. The lack of standardisation is making life difficult for everybody involved. Feature-rich phones, for example, rely on Java to run applications. This has turned out to be a Pandora's box for developers. "Java: develop once and test forever for each version," laughs Sony Ericsson's Mats Lindoff. Smartphones, in contrast, are somewhat easier to run, because their sophisticated operating systems provide a more stable environment. Not everybody is convinced. Development costs make complex operating systems expensive, says Dr T K Srikanth, head of product management at Sasken, a mobile communications firm. "Smartphones," says Dr Srikanth, "are still not solid revenue generators for handset manufacturers, they simply do not sell in the volume necessary." Of course, hardware and software costs are coming down rapidly. "It's less and less the case that people say I want this but can't afford it," says Symbian's Nigel Clifford. It's a global phenomenon, and Asian markets are the main drivers. Japan is still 18 months or two years ahead of everybody else, says Mr Clifford, but China is catching up fast. In the second quarter of this year, consumers in China bought 40% more smartphones than those in the US. In India, "more people access the internet from their phone than from a PC, a scenario that will certainly play out right across the globe," says Dr Srikanth. In Bangladesh, meanwhile, more people are using the popular Opera mini browser for mobile phones than there are computers in the country, says Jon von Tetzchner, chief executive of Opera. While manufacturers and operators fine-tune their phones to fit a plethora of market segments, the media industry is in the starting blocks to offer consumers an avalanche of mobile content. There is just one hitch: Can they sell it? Phones may get cheaper, but call plans are the cost factor that is holding back the digital mobile revolution. They are simply too confusing. In the UK for example, T-Mobile offers an "unlimited download" plan (in reality with a one gigabyte limit) for about £7.50 a month. Customers of Virgin Media (which uses T-Mobile's network) have to fork out two or three quid after downloading just a few web pages. This unpredictability means that media firms can't tell their customers how much it will cost to download and use their content. Marc Lepetit at Phoenix Film in Berlin has developed a series of short films for distribution on mobile phones: "Right now it doesn't make sense to offer this content, because the varying call plans may confuse users." "Hidden download costs make mobile content so expensive that we have decided to wait until there are more transparent flat-rate tariffs," says Mr Lepetit. "The price plan is a phenomenal issue," confirms Paul Goode. It's probably no accident that most people use a lot of data just after they've got a new phone - downloading ringtones, programmes, playing around - only for this activity to tail off quickly, says the M:Metrics analyst. In Sweden, says Sony Ericsson's Mats Lindoff, the all-you-can-eat price plan of mobile operator Three has completely changed the game. "It is used like crazy, Three had to buy new base stations just to cope with demand," he says. Flat rates equal large customer numbers, and "once you've got a large group of customers, and you have that revenue, you can invest in services that may bring in additional revenue streams," says T-Mobile's Richard Warmsley. So what will we do in five years, clutching the mobile phone equivalent of a Swiss army knife? "Watch Japan," says Symbian boss Nigel Clifford. "The business world is oriented to mobile working. Commuters catch up on TV programmes. 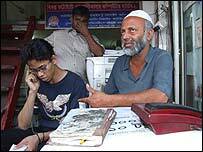 People compare shop prices on the internet, and pay for goods with their phones." Mr Lindoff tips social networking, music, e-mail and location based services to be big winners. His colleague Anders Runevad believes the user-centric web 2.0 model will be translated to the mobile world. And Mr Warmsley reports that his customers are "very big" on social networking. Soon we may all lead much smarter (phone) lives. And soon a rapidly growing industry could get very rich.